available in this current recruitment of Mazagon Dock. Selection for these vacancies will be held based on written test and trade test wherever required. Interested and sufficient skills having candidates can submit their application form through online on or before 29-10-2017. Application fee payment offline for the Mazagon Dock Recruitment is on or before 31-10-2017. Merit list will be displayed in www.mazagaondock.com website on 14-11-2017. 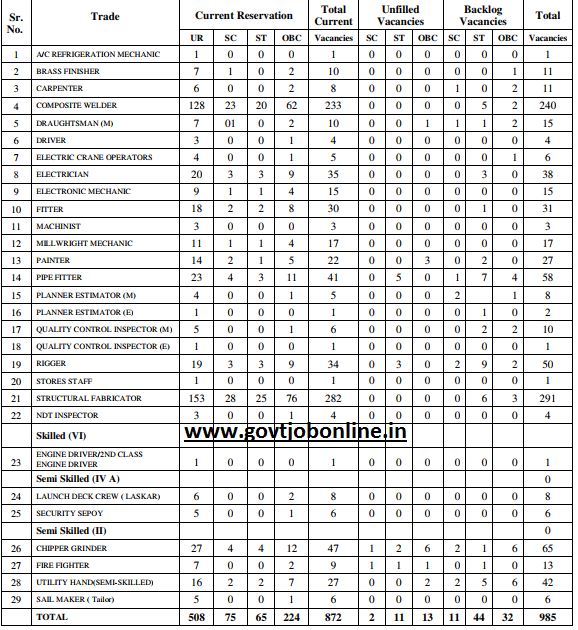 For more details of age limits, trade wise vacancy, exam pattern and other details for Mazagon Dock recruitment is given below. Contract Period is 2 years for all the categories. 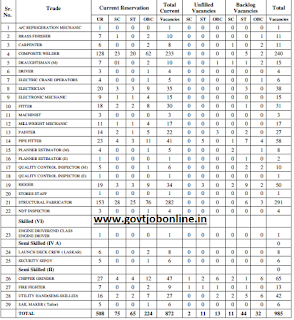 There are total 985 vacancies available in this current recruitment of Technical Staff and Operatives. Candidate's upper age limit is 33 years and lower age limit is 18 years as on 01-09-2017. Age relaxations for SC Candidates is 5 years and for BC candidates 3 years. For post wise educational qualifications please refer the official notification. Rs.100 has to pay for the application process fee and Rs.40/- towards bank charges through State Bank of India chalan which is available in Official notification. Selection will be held based on written test and trade test. Written test syllabus will be their academic syllabus only. For exam pattern and syllabus please see the official notification. Eligible candidates have to submit the application form online through official website of Mazagon Dock Shipbuilders Ltd @ www.mazagaon.com. Online application form to be submission of MDSL is on or before 29-10-2017.